How are all of you sweeties doing?I am well too. M·A·C Eye Shadow contains a special blend of ingredients to provide even application and adhesion to the skin.They are comfortable to wear & also have vitamin E as an antioxidant. I love the different textures and finishes of MAC shades.They are very long lasting and stay in place even without an eye shadow base or primer but when a base is used the colors come out even better.I am sure that MAC Cosmetics make the best eye shadows ever.Though they are priced towards the higher end like PRS 1900 TO 2100 at different stores bt all I have to say is that each one is worth the price & they speak for themselves when applied to the eyes. M.A.C Pigments are made of highly concentrated loose powder.They are said to be long lasting & are easily blended.Used along with a few drops of water creates a great finish.They can also be used as a base color for the normal MAC Eye shadows.But if I was given the choice i would buy simple eye shadows rather than pigments from MAC. 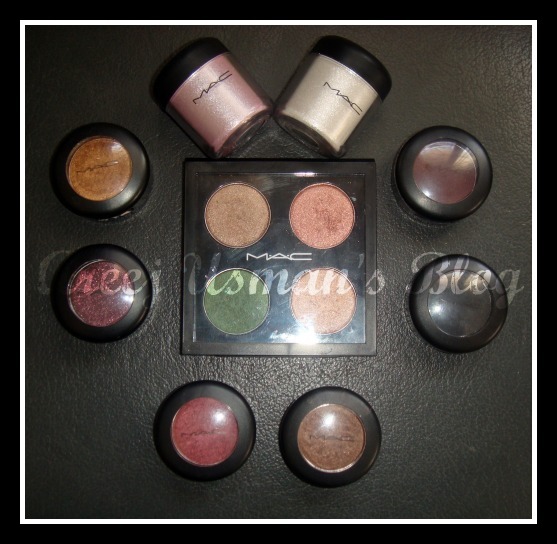 Which MAC eye shades have you used and which are your favorites.My most fav shade is AMBER LIGHTS. carbon and humid are my all time favorite eye shadows…you have a very nice collection. DalaLuz I dont know y the MAC Eyeshadows behaved that way.Usually they have great staying power! Awesome! 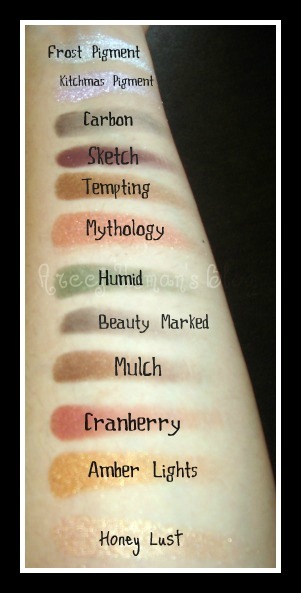 these swatches are great and the colors are beautiful! :)a very informative post along with pictures makes things much more clear and easier to understand.Love your choices!!! !Mac does a fantastic jobs showcasing beautiful highly pigmented eyeshadows.I am so tempted to buy it !! I love this post. :) Thanks so much for sharing!